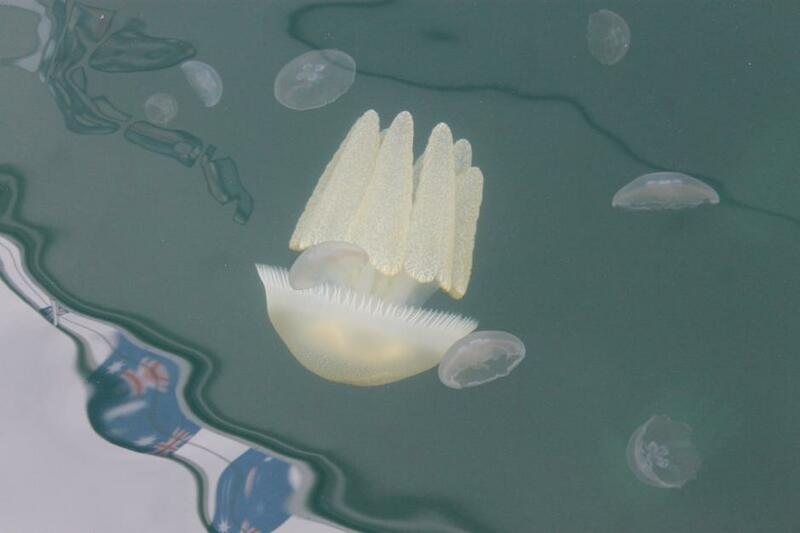 Last Saturday while at the Royal Motor Yacht Club- Broken Bay, at Newport, what are termed ‘blooms’ of jellyfish were sighted. Smaller ones seemed to be gathering in a cloud among boats moored along the seawalls while another kind moved as gracefully as ballerinas through the water, seemingly curious about those looking down at them or attracted to the hulls of vessels. They were beautiful, colourful but we didn’t know what kinds they were. A little research allows us to share these visions and their classifications in the marine world. They also remind that there are other seemingly ‘jellyfish’ like marine species that gather in our waters and wahs on our shores that aren’t actually jellyfish. We’ve been collecting a record of these to share too. Firstly a little bit about jellyfish though: Jellyfish are plankton (from the Greek word planktos, meaning to wander or drift) and are not strong swimmers, which keeps them at the mercy of the ocean currents. Blooms often form where two currents meet and if there is an onshore breeze thousands of jellyfish can be beached. Anemones, corals, jellyfishes and hydroids are collectively known as cnidarians. Cnidaria comes from the Greek word cnidos, which means stinging nettle. Cnidarians are classified into four main groups: the almost wholly sessile Anthozoa (sea anemones, corals, sea pens); swimming Scyphozoa (jellyfish); Cubozoa (box jellies); and Hydrozoa, a group that includes all freshwater cnidarians as well as many marine forms, and has both sessile members such as Hydra and colonial swimmers such as the Portuguese Man o' War. Fossil cnidarians have been found in rocks formed about 580 million years ago, and other fossils show that corals may have been present shortly before 490 million years ago and diversified a few million years later. There are over 10, 000 known species. Most jellyfish live less than one year, and some some of the smallest may live only a few days. Each species has a natural life cycle in which the jellyfish form is only part of the life cycle The most familiar stage is the medusa stage, where the jelly usually swims around and has tentacles hanging down. Male and female medusae reproduce and form thousands of very small larvae called planulae. The larvae then settle on the bottom of the ocean on rocks and oyster shells and form a small polyp that looks just like a tiny sea anemone. Each polyp will bud off many baby jellyfish called ephyrae that grow very quickly into adult medusae. Some scientists believe that jellyfish have increased because coastal development helps provide more underwater habitat for jellyfish polyps to grow. The Moon Jelly Aurelia aurita (also called the moon jellyfish, common jellyfish, or saucer jelly) is a common ocean animal and can be extremely abundant as seen here. Currents often sweep them into sheltered bays. They live in oceans, coastal waters and estuaries. 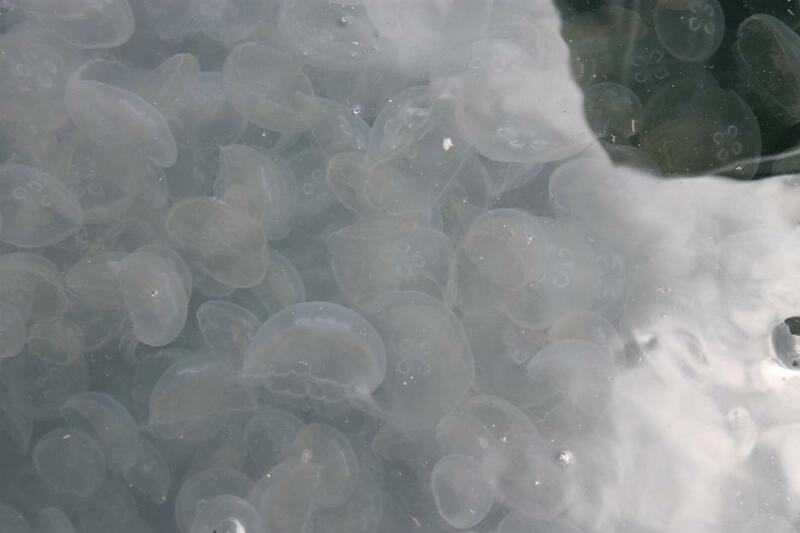 All species in the genus are closely related, and it is difficult to identify Aurelia medusae without genetic sampling; most of what follows applies equally to all species of the genus: The medusa is translucent, usually about 25–40 cm in diameter, and can be recognized by its four horseshoe-shaped gonads, easily seen through the top of the bell. It feeds by collecting medusae, plankton and mollusks with its tentacles, and bringing them into its body for digestion. It is capable of only limited motion, and drifts with the current, even when swimming. The Portuguese Man O' War Physalia physalis, also known as the Portuguese Man-Of-War, Man-Of-War, or Bluebottle, is a jellyfish-like marine cnidarian of the familyPhysaliidae. Its venomous tentacles can deliver a powerful sting. The name "man o' war" comes from the man-of-war, a 16th-century armed sailing ship, and the cnidarian's supposed resemblance to the Portuguese version at full sail. This species and the smaller Indo-Pacific man o' war are responsible for around 10,000 human stings in Australia each summer, particularly on the east coast. The Portuguese man o' war is a carnivore which uses its venomous tentacles, a man o' war traps and paralyzes its prey. Typically, men o' war feed upon small aquatic organisms, such as fish and plankton. They form a part of the loggerhead turtles diet. To follow up with the application of hot water (45 °C/113 °F) to the affected area from anywhere between 15-20 minutes which eases the pain of a sting by denaturing the toxins. If eyes have been affected, to irrigate with copious amounts of room-temperature tap water for at least 15 minutes, and if vision blurs or the eyes continue to tear, hurt, swell, or show light sensitivity after irrigating, or there is any concern, to see a doctor as soon as possible. These half arc crescent- jelly like objects are actually the egg sacs of Sand Snails. There are a few species of Sand Snails common in our area. The Conical Sand Snail (Polinices conicus) is a honey-coloured, pear-shaped shell with a brown or orange band along the top of each whorl. It grows to 42mm and is found on sand flats of sheltered beaches and estuaries. Polinices incei grows to about the same size but varies in colour and is rounder. The Sordid or Leaden Sand Snail (Polinices sordidus) prefers the more muddy conditions of estuaries. Its shell, which grows to about 36mm, varies from grey to brown with an orange outer lip. (3.) Sand snails lay their eggs in these kidney-shaped egg jellies, sometimes called ‘horseshoe jellies’. If you hold them up to the light you will see spots inside which are the tiny eggs. This one was photographed on the mudflats of Careel Bay in 2009. The one shown here was found adjacent to Station Beach, Palm Beach on Thursday, perhaps discarded by someone who decided against taking the smell home. Although these marine creatures and offcasts from new marine creatures are beautiful, advising our younger generation not to step on them with bare feet or handle them will ensure they don’t get stung. Bluebottles do still sting those who jog over them while still wet, even hours after being washed onto the sand, and most jellyfish, if they can sting their prey, can sting you too. 3.Jenny Edwards. Murder Mysteries. Nature Coast Marine Group Inc. (NCMG) - 20 July 2004. Photo of Shark egg with shark still in it: ‘New life’ by and courtesy of Boeddha, March, 2009. How a Jellyfish swims - Chrysaora quinquecirrha ("sea nettle") swimming by Kuma 1024; taken at Ocean Park Hong Kong. Report and Pictures by A J Guesdon, 2013.